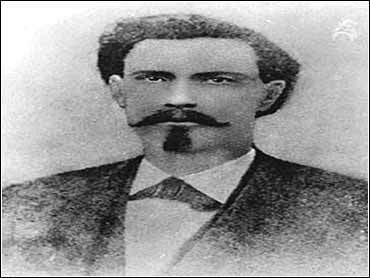 Outlaw Wild Bill Longley twice cheated the noose, but popular Texas folklore that he got away a third time is wrong. Scientists say tests of the body in his grave show that it is, indeed, Longley. "We now can put the controversy to rest. Bill Longley has been dead 123 years and it's good to have it all cleared," Michael Reese of Houston, a Longley descendant, said Wednesday. Reese attended a briefing at the Smithsonian's National Museum of Natural History where forensic anthropologist Douglas Owsley described his 15-year effort to track down Longley's grave and solve the question of who, if anyone, was in it. Longley, an outlaw with a fast draw and a faster temper was said to have killed 32 people in the years after the Civil War. His tale was romanticized in the television series "The Texan" where the character Big Bill Longley was played by Rory Calhoun. "We believe this is William Preston Longley," Owsley said, unveiling the remains recovered from the grave. Dr. Terry Melton of Mitotyping Technologies in State College, Pa., reported that DNA recovered from one of the teeth in the burial matched that of Helen Chapman, a granddaughter of Longley's sister. And Owsley noted that the casket contained a Catholic religious medal and the remains of a celluloid flower that Longley was known to have had with him on the scaffold. Twice Longley had cheated death. Once, he was hung by vigilantes who then turned and began shooting at him while one bullet severed the rope, allowing him to flee. Then, on Oct. 11, 1878, on Sheriff James Madison Brown's first try to hang him, the rope proved too long and he dropped to the ground. Deputies then hoisted him up and, 11 minutes later, he was pronounced dead. Folklore insists that the last hanging was a hoax, thanks to a bribed sheriff. The original long rope prevented Longley's neck from being broken, and he didn't strangle because the rope was really attached to a harness under his clothing. That's the folklore, at least. The tales say his casket was filled with stones and he lived on for many years, settling in Louisiana. That's where Owsley got involved. In 1986, he was teaching at Louisiana State University when Ted Wax of Gonzales, La., asked him to help sort out his family history. Wax's mother had died and in her papers he found an indication that his grandfather, named Brown, had been wanted for murder in Texas under the name Longley. Owsley said his findings show that the Louisiana man and Wild Bill Longley were not the same. The major problem was finding the grave that held the desperado, one of the first two-gun fast draw experts. His resting spot was unmarked and outside the cemetery in Giddings, Texas, where he finally met his end. The cemetery where he was buried grew, trees died and new ones were planted. The scene changed. A petrified wood marker was placed on Longley's grave in the 1920s, but the caretaker's records indicaed the marker was later moved for various reasons. As the marker was moved, the body lay where it had been buried. Elderly members of the Longley family were unsure of the location of the grave, so Owsley turned to LSU geologist Brooks Ellwood. An expert in remote sensing, Ellwood used a variety of methods including magnetometers, electrical resistance testing and earth samples in the search for the grave. Finally they found a photo taken of the marked grave in the 1930s. Using computer digital imaging, they were able to compare it with photos of the cemetery taken today, deleting headstones installed since the picture was taken. They located the spot, coordinating on three old trees and five grave markers. And there they found the unmarked grave. After the Civil War, Longley and other young toughs began a campaign of terrorizing newly freed slaves. Later he worked as a cowboy in Kansas and Texas and at one time, claimed to have been involved in 32 killings. He had a $1,000 reward on his head. He was arrested in 1873, but when the reward wasn't paid, he was set free. Three years later he was arrested again but escaped in the confusion after setting the jail on fire. The final arrest came in 1878. He was tried and sentenced to death for murder. Just before his hanging, he reduced his claimed toll to just eight killings and decided to join the Roman Catholic Church. © 2001 The Associated Press. All Rights Reserved. This material may not be published, broadcast, rewritten, or redistributed.